St. Joseph Catholic Parish in Kinshasa is a meeting ground for activists advocating for good governance. Last month, a special service was held there for activists who have been killed, and for those being detained. Some parishioners wept during the service. The bishop, cloaked in crimson robes, spoke in a grave, urgent voice. “We must never forget the martyrs,” he told the crowd. According to the Catholic Church, at least a dozen people have been killed in recent months during Church-organized pro-democracy rallies, as the Democratic Republic of Congo prepares for long-delayed elections on December 23. The Catholic Church is a powerful pro-democracy force in the DRC. Nearly half of the country’s 78 million people are members. Since anti-government protests began early in 2017, security forces have been targeting certain churchgoers, like Gertrude Ekombe, who participated in the first church organized protest on December 31, 2017. “We did not go back home to our families. We are living in clandestine since January until today. For our security, we inform the U.N. Mission MONUSCO about our movements and some of their agents go before us whenever we go out,” Ekombe says. Ekombe says she knew one young girl who was killed in the protests, and another whose jaw was "almost broken." Rossy Mukendi, an assistant university professor, was killed during a protest in February 2017. His death triggered an outpouring of public anger. His sister, Mirielle Timanga, said the family was always concerned about his anti-government activism. “We found it always dangerous. Personally, I used to tell him that we are in Africa with its tyrants here it’s all very dangerous, but he refused,” Timanga says. The government says it is still investigating the death. Timanga says she would have wanted her brother to see a better Congo. The demonstrations began after President Joseph Kabila refused to step down at the end of his second term in December 2016, despite an agreement, with political parties, mediated by the Catholic Church. Last month Kabila, who has been in power since 2001, announced he would step aside. Kabila said he is supporting former Interior Minister Emmanuel Shadary in the polls. 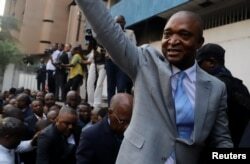 FILE - Former Congolese Interior Minister Emmanuel Ramazani Shadary waves to his supporters as he arrives to file his candidacy for the presidential election, at the Congo's electoral commission head offices at the Gombe Municipality in Kinshasa. The government excluded former Vice President Jean-Pierre Bemba and former provincial governor Moise Katumbi from running, raising questions about transparency. The final list of 21 candidates, published Wednesday, does include several Kabila critics. Catholic bishops support a lay committee known as the CLC to coordinate the Church’s activism. “CLC’s determination remains unchanged. We want the pre-electoral environment to be safe enough before going to the December vote. For now, it is not the case. The contest is filled with uncertainties and irregularities and under such conditions a credible and fair election can’t be held. This the main point of our fight,” CLC spokesperson Jonas Tshiombela says. Lambert Mende, the federal minister of communication, says the Catholic Church leadership is overstepping its boundaries. 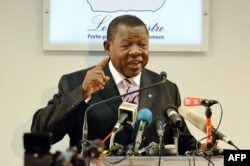 FILE - Congolese government spokesman and minister of information, communications and medias Lambert Mende. “So let them remove their status as bishops and become politicians and we will run together and will see who will win. We’re talking of leading a country and it’s not for bishops to lead a country,” Mende says. Mende also blames Western governments for interfering in local politics and inciting protests. He said some of the local Catholic bishops are being sponsored by Western governments. It’s a recurring line among government officials in the DRC. 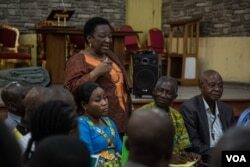 Parishioners like Ekombe say as long as the Church leadership continues to back them, they’ll continue to nonviolently demand greater democracy in the DRC. “We have dangers over our heads every day, but we must go all the way,” Ekombe says. This reporting was supported by the International Women’s Media Foundation through the African Great Lakes Reporting Initiative.